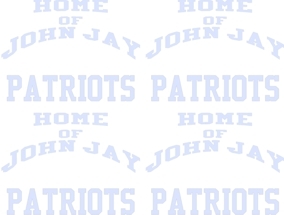 John Jay High School Patriots - Embroidered Pom Pom Beanie. Patriot's logo on front & "Your Name" on Side of Pom Pom Beanie. Offered in no other store or website. Contact: KEN'S SCREENING to order your batch. Add an optional team's name to the rear of the Beanie (maximum 19 characters). Designed with the latest technology. With an all-over sublimated digital camo print and powerful moisture wicking, CamoHex delivers high performance and bold style for athletes and fans alike. Hitting the pavement "now". Available in your school colors. Call 845.475.8221 for a fast price quote. *Starting prices are for orders above 25 pieces. Relax, enjoy your favorite brew in a John Jay Patriots mug. JOHN JAY HIGH SCHOOL SPIRIT 11oz Custom mug. Order your "John Jay High School Mug" as pictured below. Add an optional team's name to the rear of the mug. Use team's name request field (maximum 19 characters).